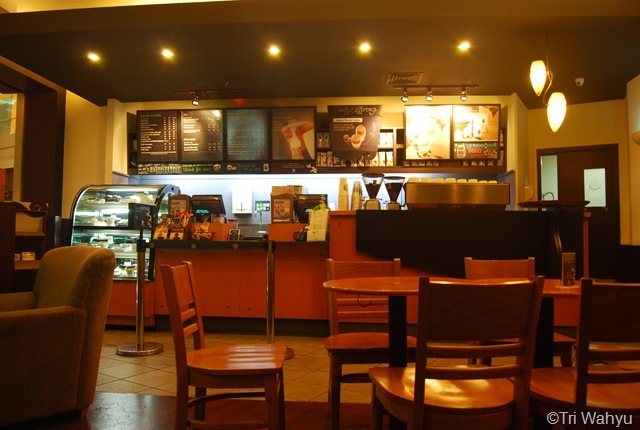 Starbucks Coffee has been franchised in Indonesia since early 2000. It has been quite popular place for high and middle class people for meeting or hang out. The cafe has growing from a single cafe in central Jakarta to become hundreds of cafe in Malls, office towers, rest areas and even inside hospitals. The cafe also open in BSD, Serpong, located inside Teras Kota Mall near the front door on right side if you are entering from main entrance. 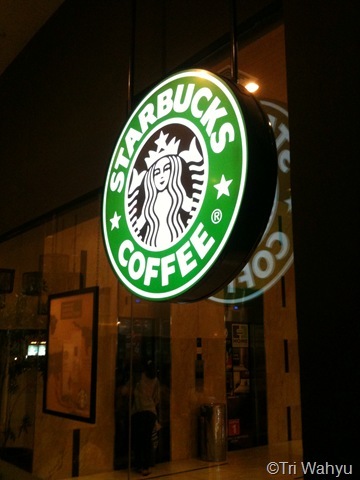 You can identify the green mermaid logo which become trademark of Starbucks Coffee. There a lot of variation of espresso, latte or coffee beverages which Starbucks Coffee can offer for customer either hot or cold drink. Nevertheless, the best coffee in Starbucks is daily brew coffee which Starbuck’s Barista make from different beans each day. One day, you probably get a bold Sumatera, then Caffe Verona on next day, lastly you will Colombian Narino Supremo at weekend. Indonesian people still don’t know about this practice and never ask barista about the coffee he/she brew today. It something that I learn from overseas and works well that people have specific day to visit Starbucks Coffee just to enjoy their favorite coffee beans. Mine is Colombian Narino Supremo due it low acidity and nutty flavor. Next, it will be best to just enjoy simple coffee or with little amount milk either cold or hot if you are true coffee lover. Most Indonesian often order coffee blend beverage, such as, Caffe Latte, Cappuccino, Caffe Mocha, Caramel Macchiato, etc. Its probably because not all people like much coffee, particularly strong one that can lead stomachache. Other people prefer order chocolate or tea based beverages, for instance, hot chocolate, green tea latte, Chai latte. Starbucks Coffee provide wide range tea selection from English Breakfast, Ear Gray, Darjeeling, Jasmine, green tea to peppermint flavor. In addition, you can ask refill hot water for tea if you are a customer who drink tea. There also coffee, chocolate and tea based cold beverages if you don’t like hot drink. They are really good consumed particularly when weather is hot or sunny day. 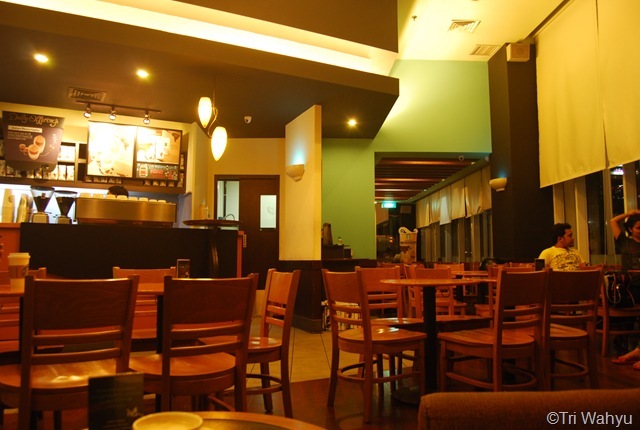 However, Indonesian orientation to visit Starbucks coffee or other famous brand cafe due place atmosphere, variety of coffee, tea or frappuccino beverages, and fresh food that place serves rather their daily activities like in overseas. In short, its about ego rather than daily life. 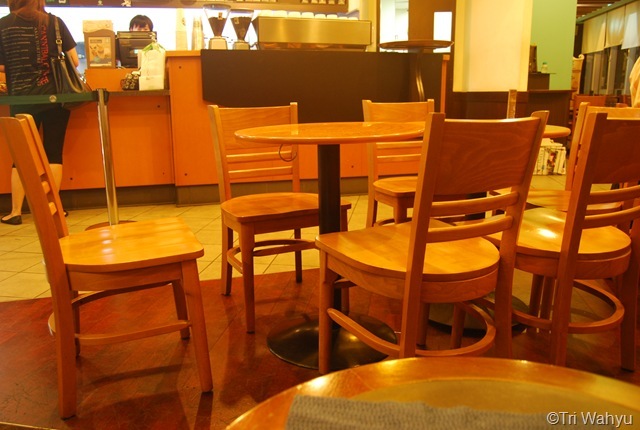 Unlike in Indonesia, Australian or European always visit Starbucks coffee or cafe, whatever it local or famous cafe, due their coffee culture that state cafe is place where you can study, works and read your favorite books or newspaper beside meeting or hang out with other. Its something that still need time to develop in Indonesia coffee culture. The cafe tend too bright on midday until dusk due direct sunlight and it’s location facing west side. 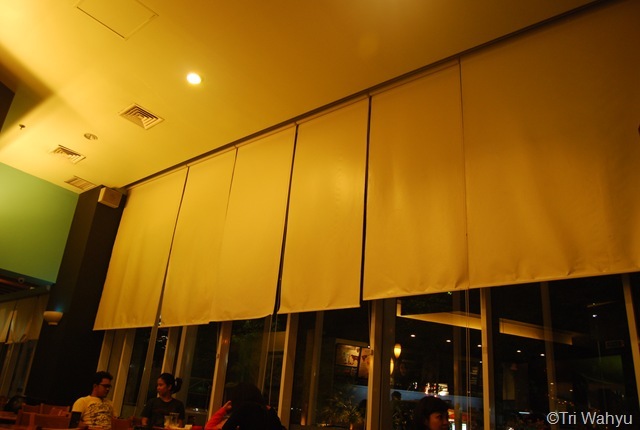 Fortunately, the management provide curtain on windows that put lower every day or customer can ask cafe employee to lowers the curtain if his/her table is too bright. 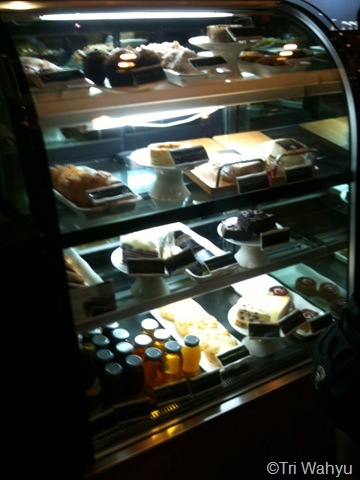 Starbucks Coffee also provide fresh foods and snacks for accompany your coffee, chocolate and tea beverages. They can be in form cold or hot meals that can be heat on customer’s request. For instance, pastries, muffins, cakes, cookies and scones. You can order light meals too such as Panini, sandwich, beef or chicken baguette if you feel hungry or have to miss your lunch time due long meeting. Starbucks Coffee is good place to preoccupied yourself. You will not realized yourself how many hours you have been stay inside the cafe until you saw it getting dark outside. The cafe also provide free white sugar and brown sugar for customer. There also free cinnamon and sweet vanilla if you like to enrich flavor your coffee.They are located in self service counter beside dusk bin and magazine or newspaper stand. The range prices for coffee, chocolate and tea beverages are between Rp 16000 IDR to Rp 60000 IDR based on what kind blend, size or additional flavor customer order. There three size glasses which Barista can offer to customer. Small and cheap size is Tall, average size named Grande, while the largest and expensive size called Venti. Meanwhile for fresh meals and snack range prices from Rp 10000 IDR up to Rp 45000 IDR. They are served as either cold or warm meals. 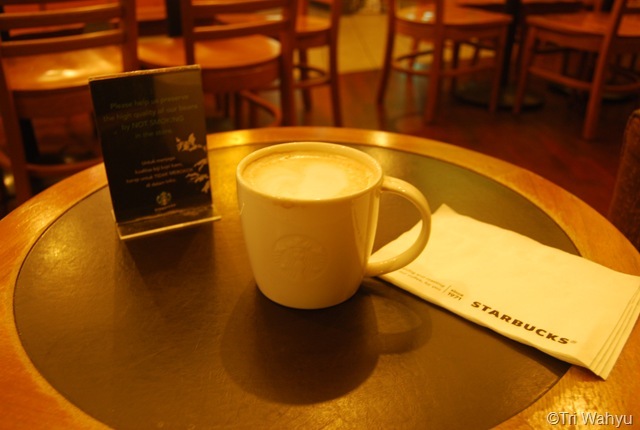 There common conception Starbucks Coffee is expensive cafe but, it is not true at all. There some ways to enjoy coffee in the cafe without spend more than Rp 50000 IDR. First, it would be better if you just order simple coffee or coffee misto that can get hot water refill due they are don’t have any other ingredients more than coffee and milk. Their taste don’t much change even after they watered. Customers can refill their coffee as much as they can, but, it will be appropriate if you just refill 2 or 3 times your coffee due risk bladder issue. Brewed Coffee price Rp 16000 IDR while coffee misto cost Rp 18000 IDR. Second, you can order hot tea if you feel coffee is too strong for you. Hot tea is good choice when it rainy or windy day. It’s hot water means it requires some time until it get warm suitable for your taste. In addition, it can be refill hot water too as much as customer like it. Hot tea can be order only Rp 16000 IDR with wide flavor selection. Thirdly, doughnut are best choice for get along with your coffee. Their sweetness and softy surface are good enough to neutralize coffee’s bitterness which cannot minimize by sugar or milk. It will be better if customer consume hole doughnut than filled donuts due it’s easier grabbing. Some costumer like to dip his/her doughnut while enjoying coffee. In summary, there always ways to enjoy your coffee in Starbucks Coffee without worry dry your wallet too much. Location: Teras kota Mall, BSD, Jln Kapten Soebianto Djojohadikusumo, Ground Floor, BSD, Serpong, Tangerang, Banten, Indonesia. Open hours 10.00 AM to 10.00 PM. Tags: Beverage, BSD, cafe, Coffee, Coffee and Tea, Coffee culture, Food, Indonesia, Latte, Latte macchiato, Serpong, Starbucks Coffee, TerasKota Mall. Bookmark the permalink. It was hard to find your site in google. You should create some high page rank contextual backlinks in order to rank your site. Thanks for your tips, George. But, I read someone mentioned google – laranita was used for spammer. Are you sure about this tools? This work by Tri Wahyu is licensed under a Creative Commons Attribution-NonCommercial-ShareAlike 4.0 International License.